Rinse and dry the thawed duck. This recipe does not call for the innards, however, you can use them anyway you want. Trim off excess skin; score a diamond pattern through the skin but not into the meat of the duck breasts; truss (tie) the legs together (for even cooking); poke holes all over the bird (to let excess fat render out); place on a roasting rack in a shallow roasting pan; sprinkle generously with Kosher salt; and place in the 300 degree oven breast-side up for 1 hour. After an hour, take out of the oven; prick holes again in the skin; flip the bird over and roast for another hour at 300 degrees with the breast-side down. After the second hour, take out of the oven; prick holes again in the skin; flip the bird over back on its back and roast for another hour at 300 degrees with the breast-side up. After the third hour, your bird is just about finished. Prick more holes in the skin. The skin should be noticeably browner and kind of crispy. Flip the bird over so the breast-side is down again and roast at 300 degrees for 30 more minutes. During those last 30 minutes you can reduce your glaze. Take the remaining ingredients and combine in a saucepan or sauté pan and bring to a simmer. Let the liquid mixture reduce until it coats the back of the spoon. It should be thick and syrupy. Set the glaze aside. After the final 30 minutes, take the bird out of the oven and turn the oven up to 425 degrees. Drain all the fat out of the pan before putting it back in the over at 425. Duck fat will start to burn at that temperature. Flip the bird back over so it is breast-side up. Once the oven is at temperature, place the bird back in to quickly crisp up the skin for 10 more minutes. 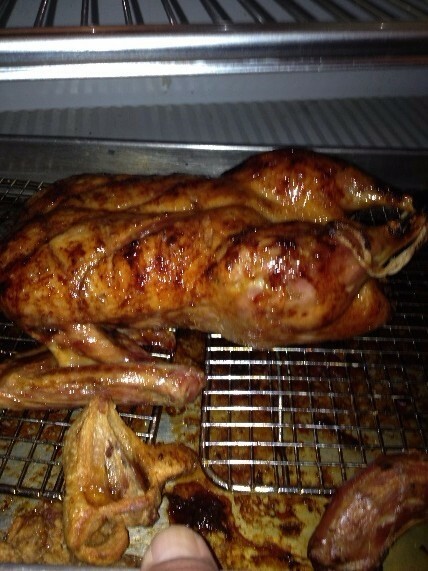 After 10 minutes in a 425 degree oven, pull the bird back out again and brush your glaze all over the bird. 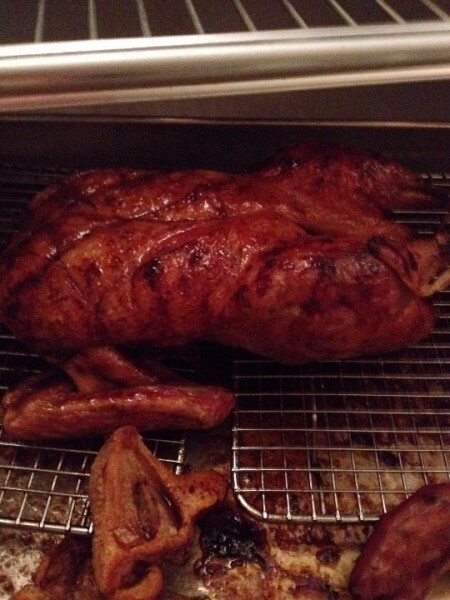 Lower your heat to 400 degrees and put the glazed bird back in the oven for 5-7 more minutes. Let it rest for 10 minutes and carve like any other bird.